Most of the people who use Internet are registered on at least one Social Media website but have you ever thought how many of the registered users are males or females? There are tons of social Network websites around. Some of them are: Facebook, Twitter, Digg, MySpace, Orkut, LinkedIn, etc. etc. etc. There is a long list. 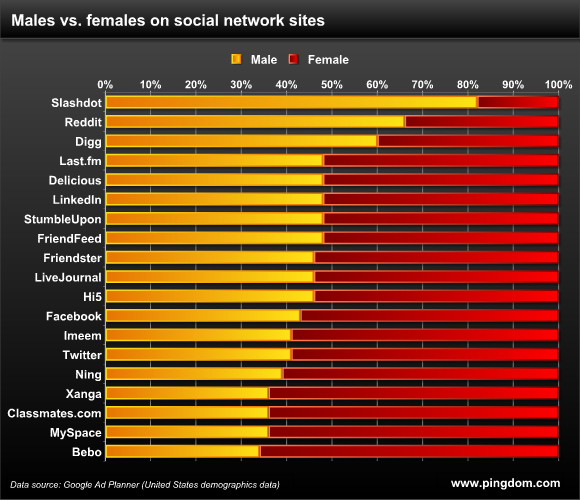 pingdom.com conducted a research on this topic and took 19 Social Network websites to see how many male and female users are on these websites. This list has all big names like Facebook, Twitter, Myspace as well as popular Social News websites such as Digg, Reddit, Slashdot etc. Full list of sites in this mini study: Facebook, LinkedIn, MySpace, Twitter, Slashdot, Reddit, Digg, Delicious, StumbleUpon, FriendFeed, Last.fm, Friendster, LiveJournal, Hi5, Imeem, Ning, Xanga, Classmates.com, Bebo. The demographics data for United States that is being used in this research was taken from the Google’s AdPlanners service. Social News websites have more male users than females. Twitter and Facebook Ratio: Almost same. 59% and 57% respectively. Most female-dominated Websites: Bebo (66% females), closely followed by MySpace and Classmates.com (64%). Average ratio of all 19 websites: 47% male, 53% female. Now the question arises, what is the reason most Social Media websites attract females more than males? One Response to "Research: Females More Active than Males on Social Networks"
I think Females have more time or maybe they are not very active in their real lives.